Water leached from growing broccoli sprouts is shown to inhibit the growth of E. coli bacteria. Sprouts (green vegetables) have long been known to be a good source of nutrition, but where water supplies are contaminated, growing them can be risky. This finding hints that some sprouts could be safer than others. 1 Johns Hopkins School of Medicine, Department of Pharmacology and Molecular Sciences, Lewis B. and Dorothy Cullman Cancer Chemoprotection Center, 2 Johns Hopkins Bloomberg School of Public Health, Center for Human Nutrition, Baltimore, Maryland, USA. Copyright: ©2007 Jed Fahey et al. The authors have been investigating the medicinal properties of broccoli sprouts for over 10 years. They report their finding that spent irrigation water used to grow these sprouts inhibits the growth of E. coli bacteria. With further investigation, methods might eventually be developed for growing sprouts as an important nutrition source in places where vegetables are unavailable or not affordable and water is scarce or contaminated. Laboratory testing showed that spent sprout irrigation water (i.e. leachates), from germinating broccoli sprouts and seeds, but not from alfalfa sprouts or seeds, inhibited the growth of non-enterohemorrhagic E. coli DH10B. Growth inhibition was inversely proportional to isothiocyanate concentration, which reached 192 μM (about 34 μg/ml) in the leachates by the seventh hour of sprout growth. Sprouts produced from Brassica spp. (cruciferous) vegetable seeds such as broccoli may offer special advantages in terms of safety from microbial contamination. If pathogen-free water supplies can be secured for the production of green sprouts, they may represent a viable alternative to fresh green vegetables in areas where hostile climate, poor soil conditions, insect predation, or even a nomadic lifestyle, preclude other agricultural pursuits such as vegetable gardening, and where trade for fresh vegetables is not a realistic possibility. Green sprouts have been part of the human diet for much of recorded history. Their commercial production has been a small niche industry in the U.S. for the past 30 or so years. They are much more widely consumed in a number of Asian countries (e.g. Japan and Korea), where they are part of mainstream diets. In the past 8 years broccoli sprouts have gained increased scientific attention due to their high content of phytochemicals that are involved in protection against cancer and other degenerative diseases (1-6). Nutritionally, green sprouts are also an excellent source of a variety of vitamins and minerals. In many ways, they are an ideal fresh vegetable, one that can be produced in 3 days’ time, in all climates, provided that an enclosed area with relatively moderate temperature, minimal light (either natural or artificial), and a source of clean fresh water is available. The most critical factor is the need for a clean water supply. If food-borne pathogens are present in the water supply, they will undoubtedly proliferate in the warm, moist environment that drums or trays of sprouts provide. Thus, we became interested in investigating the potentiality that some types of sprouts (certain edible plant species) might serve to antagonize or prevent the growth of the human pathogens that most frequently become problematic in situations of potable water contamination. While success in this endeavor should not be viewed as a go-ahead to produce green sprouts in areas with very poor sanitation and contaminated water supplies, this approach might ultimately be combined with other imaginative approaches. With additional creative inputs, it may be possible to develop local production of a ready source of fresh vegetables in areas where climate, soil, predation, or even a nomadic lifestyle might preclude other agricultural pursuits such as vegetable gardening. Sprouts are grown from seeds placed in environmentally controlled, hydroponic conditions and incubated in warm, moist conditions which are ideal environments for microbial growth. If Escherichia coli or Salmonella spp. are present on the surface of the seed, it is likely that they will multiply in the sprouting environment. To date, no practical methods have been developed to check the growth of these contaminants during germination and sprout growth or processing. They must therefore be prevented from entering the process. If contamination occurs the affected final product must be identified and destroyed. It is therefore essential that seeds to be used for sprouting undergo surface-disinfection by treatment with a biocide. The efficacy of such agents, most notably calcium hypochlorite, has been extensively documented in the laboratories of Beuchat and colleagues (7-11), as well as others (12-14). When these agents are used correctly the resulting sprouts are safe to eat. A recommendation to use such a surface disinfection process is now part of a guidance that the U.S. FDA issued in 1999 (15). In addition to these safeguards, sprouts of cruciferous or Brassica spp. vegetable seeds have a second-line defense against contamination in that they produce secondary metabolites, also known as phytochemicals, which have bactericidal activity. This bactericidal activity of isothiocyanates has been known for many years. Isothiocyanates and the glucosinolate / myrosinase system that leads to their production plays a major role in plant defense against fungal diseases and pest infestation (16). This activity has been discussed extensively in the plant and microbial literature (reviewed by 16-18). The antimicrobial effects and mode of action of allyl isothiocyanate have been examined against an array of bacteria and fungi including E. coli. (19,20). Over 40 years ago, the antibacterial effects of 15 isothiocyanates were evaluated on 10 test organisms, including both gram positive and gram negative organisms and including E. coli (21). Kim et al. (22) utilized allyl isothiocyanate (from the glucosinolate, sinigrin) as an antimicrobial on cooked rice. Park et al. (23) recently determined that although allyl isothiocyanate is a highly effective agent against E. coli 0157:H7 on alfalfa seeds, it also has negative effects on seed viability. Sulforaphane, the isothiocyanate of glucoraphanin from broccoli and broccoli sprouts, was originally isolated from the cruciferous weed hoary cress (Cardaria draba), based upon its bactericidal activity (24). This antimicrobial activity against a range of bacteria and fungi was further characterized by Dornberger (25), and it was recently demonstrated to have potent activity against the human bacterial pathogen and carcinogen – Helicobacter pylori (2). H. pylori is the causative agent of much of the world’s gastritis, ulcers, and stomach cancer (26). Sulforaphane, a compound unique to the cruciferous species, is a potent bacteriostatic and bactericidal agent against both reference strains and clinical isolates of H. pylori, including those that were resistant to multiple synthetic antibiotics. Sulforaphane, in contrast to allyl isothiocyanate, is much less volatile, and does not have similar effects upon seed viability. We present herein, evidence of the bactericidal activity of broccoli seed and sprout leachate (i.e., spent sprout irrigation water), but not alfalfa seed and sprout leachate, against a laboratory strain of E. coli. We discuss the potential bactericidal activity in broccoli and perhaps other cruciferous sprouts (e.g., cabbage, arugula, kale, radish, mustard, cress and daikon), which may bolster the safety profile of these sprouts in particular. In a laboratory setting, about 600 g of both broccoli and alfalfa seeds (Caudill Seed Co., Louisville, KY, USA) were placed in separate, adjacent trays on a commercial-style tray-type sprout cart. Before being placed on the sprout cart, the broccoli and alfalfa seeds were surface-disinfected by immersing them in a solution of 25% Clorox® commercial bleach (ca. 13,000 ppm of sodium hypochlorite) in water with 30 mg/L Alconox® laboratory detergent for 15 minutes, and then exhaustively rinsing the seeds with water -- similar to commonly accepted protocols used by the sprouting industry. The seeds were then placed in an inclined sprouting tray, rinsed again with spray from an overhead mist nozzle, and then allowed to sit undisturbed for 1 hour. After one hour, water was delivered via overhead mist until about 200 ml of liquid per sprouting tray had run off and been collected. Misting was continued using six 20-second sprays per hour until the next collection period, at which time the trays were again left undisturbed for 1 hour. After this hour the leachate was rinsed away with fresh water and collected. The amounts and types of glucosinolates present were determined by established spectrophotometric and HPLC methods (27-29). Total glucosinolate + isothiocyanate determinations were made after digestion of leachate samples with purified myrosinase (0.003 U/ml) and ascorbate (500 µM), by the cyclocondensation reaction as described by Zhang and colleagues (29). Leachate collected as described above was assessed for its effect on the growth in broth culture of E. coli K12 strain DH10B (laboratory collection). Bacterial growth at 37˚C in the dark was monitored in complete Luria Broth (LB), as well as in a 10-fold dilution of this medium (LB/10). The culture media were prepared by adding the dry ingredients (10 g/L tryptone, 5 g/L yeast extract, and 10 g/L NaCl for full-strength medium) to the appropriate volume of water, or to leachate from collections made following disinfection of the seeds as described above. (Tryptone and yeast extract were from Difco Laboratories, Detroit, MI, USA; all other reagents were from Sigma-Aldrich, St. Louis, MO, USA). Once the dry LB or LB/10 ingredients were dissolved, the pH was adjusted to pH 7.5 with NaOH, and the medium was filter-sterilized and used for the cultivation of E. coli DH10B. The LB/10 was prepared with leachates collected after the first, fourth, and seventh hour of broccoli seed germination. Bacterial growth was monitored according to standard methods by measuring the increase in absorbance at 550 or 600 nm, compared to an appropriate sterile medium control or water, on a UVMax microtiter plate reader (Molecular Devices Corp., Sunnyvale, CA, USA). In separate experiments, freeze-dried leachates were added to liquid medium and leachate was used to prepare agar-solidified medium (1.5% Bacto Difco Agar). Dry weight determinations were made on leachates by evaporating a subsample and holding it at 105ºC until a constant weight was attained. Growth on semi-solid medium was monitored by spot-plating 20 :L drops of an appropriate dilution (calculated to yield between 3 and 30 CFU/drop) of viable bacterial culture (30) on both control and leachate-amended media. The initial broccoli seed waste/rinse waters, collectively termed “the leachate,” had a pH of 6.8 and was straw-colored. The levels of isothiocyanate in the leachate from broccoli seeds and sprouts increased from about 13 µM after the first hour of growth following the seed disinfection treatment, to about 102 µM and 192 µM after the fourth and seventh hour of growth, respectively. Levels of glucoraphanin (the precursor of sulforaphane) were highest at the fourth hour, and the glucosinolate concentrations were 148, 242 and 154 µM at the 1, 4 and 7 h collection times, respectively. Glucosinolates recovered consisted of 99.4% glucoraphanin and 0.6% neoglucobrassicin. In contrast, there were no traces of these compounds when alfalfa seeds/sprouts were treated in the same manner. Recovery of total dissolved solids (dry weight) from the hourly broccoli leachate collections ranged from 3.9 to 5.2 mg/ml. Total recovery of glucoraphanin from the seeds was as high as 81.5 nmol/g seed/h. When leaching was continued for 12 h, about 1 µmol of glucoraphanin per gram of seed, or about 2% of the total glucoraphanin content of the seed used in these experiments, was thus leached out of them. Leaching of glucosinolates rapidly falls off as sprouts are grown further, such that the majority of the glucoraphanin initially present in the seeds can still be found in the sprouts grown from those seeds (data not presented;3,31). The growth inhibitory activity of broccoli seed and sprout leachate was unaffected by freeze-drying or heating to 50°C, but such activity was rapidly lost upon mixing with an agar base. There was a substantial inhibitory effect on bacterial growth of broccoli seed leachate when amended into Luria Broth (LB; Figs. 1 & 2). In contrast, no inhibitory effect of the leachate obtained from alfalfa seeds was observed (Fig. 2). This growth inhibitory effect was even more dramatic in a low nutrient medium background (LB/10) since bacterial growth was completely halted (Fig. 3; relative bacterial numbers and viability was confirmed by drop-plating samples at various time points onto semi-solid Luria Broth [data not shown]). This low nutrient environment is in fact more representative of the actual “nutrient conditions” that exist during the sprouting process, since, as discussed in the previous section, sprout leachates had total dissolved solids contents of 4-5 mg/L, whereas LB contains 15 mg/L of extremely rich organic material (10 mg/L tryptone and 5 mg/L yeast extract). In addition to being more congruent with sprout leachate from a nutrient density perspective, sulforaphane or other isothiocyanates would likely be more rapidly complexed or bound in a growth medium as rich as LB. Thus, LB/10 was used for further studies. LB/10 was prepared with leachates collected after the first, fourth, and seventh hour of seed germination. 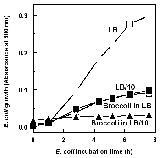 There was a potent inhibitory effect of the broccoli seed/sprout leachate on bacterial growth. This inhibitory effect increased with time over the germination period (Figure 4). The differential effects were rank-correlated with the isothiocyanate content and with the glucosinolate-isothiocyanate content of the leachate (see Fig. 1), and the bactericidal activity had disappeared by the third day of broccoli sprout growth [data not shown]. There was in fact a stimulatory effect of alfalfa seed leachates on bacterial growth: a 34% increase in final bacterial titer was observed after incubation with the 7h alfalfa leachate. None of the alfalfa sprout leachates showed any growth inhibitory effect on the E. coli strain tested (Figure 4). We have evaluated the bactericidal activity of leachates (i.e., spent irrigation water) from sprouting seeds of broccoli. Leachates from germinating broccoli sprouts, but not from alfalfa sprouts, have significant capacity to inhibit the growth of E. coli DH10B in spent sprout irrigation water. Although we have not tested these leachates against other isolates or pathovars of E. coli or against Salmonella spp., we have attempted to highlight the potential bactericidal activity of broccoli and perhaps other cruciferous sprouts. Antimicrobial activity falls off after 7 hours, perhaps due to reduced leaching or to increased binding of isothiocyanates to organic matter. Nonetheless, the early activity may provide special advantages from the perspective of increased protection from microbial contamination. Further testing against other bacterial strains, and testing of production-scale drums that have been deliberately inoculated with pathogens, is of course warranted. When combined with a seed surface-disinfection step, the bactericidal activity demonstrated herein addresses a separate and independent avenue for achieving higher levels of food safety in sprouts of broccoli and perhaps other cruciferous vegetables. With proper attention to growing conditions and assurance of a pathogen-free water supply, the advantages of fresh green sprouts might ultimately be safely realized by those who by virtue of climate, geography, or a host of other social-economic factors are not able to produce or obtain green vegetables that are part of a healthy diet. One of the authors (JWF), as well as Johns Hopkins University, own stock in Brassica Protection Products (BPP), a company whose mission is to develop chemoprotective food products and which sells broccoli sprouts in the U.S., Belgium, France, Germany, Japan, Korea, the Netherlands, and New Zealand. JWF is a co-founder and an unpaid scientific consultant to BPP and his stock is subject to certain restrictions under University policy. The terms of this arrangement are being managed by Johns Hopkins University in accordance with its conflict of interest policies. This work was supported by unrestricted research funds generously provided by the Lewis B. and Dorothy Cullman Foundation. We acknowledge many colleagues, in particular Doug Archer, Arthur Davis, Fred Degnan, Paul Swidersky, and Paul Talalay, for perceptive, critical reading of early versions of this manuscript. A portion of this paper was presented at the FDA, Center for Food Safety and Applied Nutrition, Public Meeting: 2005 Sprout Safety, May 17, 2005, College Park Maryland, which can be accussed at: http://www.cfsan.fda.gov/~dms/sprotran.html#1#sprofahe. Brooks JD, VG Paton, and G Vidanes (2001) Potent induction of phase 2 enzymes in human prostate cells by sulforaphane. American Association of Cancer Research 10:949-954. Fahey JW, X Haristoy, PM Dolan, TW Kensler, I Scholtus, KK Stephenson, P Talalay, and A Lozniewski (2002) Sulforaphane inhibits extracellular, intracellular, and antibiotic-resistant strains of Helicobacter pylori and prevents benzo[a]pyrene-induced stomach tumors. Proceedings for the National Academy of Sciences USA 99:7610-7615. Fahey JW, Y Zhang, and P Talalay (1997) Broccoli sprouts: an exceptionally rich source of inducers of enzymes that protect against chemical carcinogens. Proceedings for the National Academy of Sciences 94:10367-10372. Gao X, AT Dinkova-Kostova, and P Talalay (2001) Powerful and prolonged protection of human retinal pigment epithelial cells, keratinocytes, and mouse leukemia cells against oxidative damage: the indirect antioxidant effects of sulforaphane. Proceedings for the National Academy of Sciences 98:15221-15226. Shapiro TA, JW Fahey, KL Wade, KK Stephenson, and P Talalay (2001) Disposition of chemoprotective glucosinolates and isothiocyanates of broccoli sprouts. American Association of Cancer Research 10:501-508. Talalay P, and JW Fahey (2001) Phytochemicals from cruciferous plants protect against cancer by modulating carcinogen metabolism. Journal of Nutrition 131:3027S-3033S. Beuchat LR (1997) Comparison of chemical treatments to kill Salmonella on alfalfa seeds destined for sprout production. International Journal of Food Microbiology 34:329-333. Holliday SL, AJ Scouten, LR Beuchat (2001) Efficacy of chemical treatments in eliminating Salmonella and Escherichia coli O157:H7 on scarified and polished alfalfa seeds. Journal of Food Protection 64:1489-1495. Jaquette CB, LR Beuchat, and BE Mahon (1996) Efficacy of chlorine and heat treatment in killing Salmonella stanley inoculated onto alfalfa seeds and growth and survival of the pathogen during sprouting and storage. Applied and Enviromental Microbiol 62:2212-2215. Scouten AJ, LR Beuchat (2002) Combined effects of chemical, heat and ultrasound treatments to kill Salmonella and Escherichia coli O157:H7 on alfalfa seeds. Journal of applied Microbiology 92:668-674. Taormina PJ, and LR Beuchat (1999) Behavior of enterohemorrhagic Escherichia coli O157:H7 on alfalfa sprouts during the sprouting process as influenced by treatments with various chemicals. Jounal of Food Protection 62:850-856. Cuero RG, JE Smith, and J Lacey (1985) The influence of gamma irradiation and sodium hypochlorite sterilization on maize seed microflora and germination. Food Microbiolgy 3:107-113. Sauer DB, and R Burroughs (1986) Disinfection of seed surfaces with sodium hypochlorite. Phytopathology 76:745-749. Schultz T, and RL Gabrielson (1986) Control of Xanthomonas campestris pv. campestris in crucifer seed with slurry treatments of calcium hypochlorite. Plant Disease 70:1027-1030. FDA (Food and Drug Administration, Center for Food Safety and Applied Nutrition) (1999) Guidance for Industry, Sampling and Microbial Testing Of Spent Irrigation Water During Sprout Production. Federal Register 64(207): 57893-57902. Rosa EAS, RK Heaney, GR Fenwick, and CAM Portas (1997) Glucosinolates in crop plants. Horticultural Review 19:99-215. Brown PD, and MJ Morra (1995) Glucosinolate-containing plant tissues as bioherbicides. Journal of Agricultural and Food Chemistry 43:3070-3074. Brabban AD and C Edwards (1995) The effects of glucosinolates and their hydrolysis products on microbial growth. Journal of Apllied Bacteriolology 79:171-177. Lin CM, JF Preston, and CI Wei (2000) Antibacterial mechanism of allyl isothiocyanate. Jounal of Food Protection 63:727-734. McKay AF, DL Garmaise, R Gaudry, HA Baker, GY Paris, RW Kay, GR Just, and R Schwartz (1959) Bacteriostats. II. The chemical and bacteriostatic properties of isothiocyanates and their derivatives. Journal of the American Chemical Society 81:4328-4335. Kim YS, ES Ahn, and DH Shin (2002) Extension of shelf life by treatment with allyl isothiocyanate in combination with acetic acid on cooked rice. Journal of Food Science67:274-279. Park CM, PJ Taormina, and LR Beuchat (2000) Efficacy of allyl isothiocyanate in killing enterohemorrhagic Escherichia coli O157:H7 on alfalfa seeds. International Journal Of Food Microbiology 56:13-20. Procházka, and I Komersová (1959) Isolace sulforaphanu z vesnovky (Cardaria draba) a jeho antimikrobni u innost. Ceskoslovenská Farmacie 8:373-376. Dornberger K, V Böckel, J Heyer, CH Schönfeld, M Tonew, and E Tonew (1975) [Investigations of the isothiocyanates erysolin and sulforaphan of Cardaria draba L]. Pharmazie 30:792-796. Sepulveda AR, and DY Graham (2002) Role of Helicobacter pylori in gastric carcinogenesis. Gastroenterolology Clinics of North America 31:517-535. Prestera T, JW Fahey, W David Holtzclaw, C Abeybunawardana, JL Kachinski, and P Talalay (1996) Comprehensive, chromatographic and spectroscopic methods for the separation and identification of intact glucosinolates. Analytical Biochemistry 239:168-179. Troyer JK, KK Stephenson, and JW Fahey (2001) Analysis of glucosinolates from broccoli and other cruciferous vegetables by hydrophilic interaction liquid chromatography. Journal of Chromatography. 919:299-304. Zhang Y, KL Wade, T Prestera, and P Talalay (1996) Quantitative determination of isothiocyanates, dithiocarbamates, carbon disulfide, and related thiocarbonyl compounds by cyclocondensation with 1,2-benzenedithiol. Analytical Biochemistry 239:160-167. Fenner F (1951) Enumeration of viable tubercle bacilli by surface plate counts. American Review of Tuberculosis. 64:353-380. Pereira FM, E Rosa, JW Fahey, KK Stephenson, R Carvalho, and A Aires (2002) Influence of temperature and ontogeny on the levels of glucosinolates in broccoli (Brassica oleracea var. italica) sprouts and their effect on the induction of mammalian Phase 2 enzymes. Journal of Agricultural and Food Chemistry 50:6239-6244. Figure 1. Effect of leachate from sprouting broccoli seeds on the growth of E. coli DH10B in 10% Luria broth (LB/10), assessed by spectrophotometry of bacterial broth cultures after 5h of incubation at 37˚C. Figure 2. Growth of E. coli DH10B, inoculated into Luria Broth prepared with distilled water, or with broccoli or alfalfa seed leachates collected 1 h after surface sterilization of seeds. Bacterial growth was assessed over 8 h by spectrophotometry of bacterial broth cultures incubated at 37˚C. Figure 3. Comparison of growth of E.coli DH10B inoculated into either Luria Broth or dilute (10%) Luria Broth prepared with distilled water (open symbols; LB or LB/10) or with broccoli seed leachate prepared in these basal media (closed symbols). Bacterial growth was assessed over 8 h by spectrophotometry of bacterial broth cultures incubated at 37˚C. Figure 4. Growth of E. coli DH10B inoculated into dilute (10%) Luria Broth prepared with water or with broccoli or alfalfa sprout leachate collected after 1h, 4h, or 7 h of seed/sprout germination. Bacterial growth was assessed over 5 h by spectrophotometry of bacterial broth cultures incubated at 37˚C. Open symbols represent alfalfa; filled symbols represent broccoli; cross ( ) represents controls. 1h ( , ); 4h ( , ); 7h ( , ).